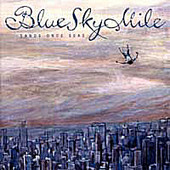 Blue Sky Mile hail from Seattle, but you'd never guess the quintet's hometown by its sound. Whiny, treble charged, and bland, this outfit's output squeals like so many of the other bands currently riding the emo wave. Mixing angular Thrice-esque riffs minus the firepower with the indie rock sensibility of bands like Taking Back Sunday, Blue Sky Mile doesn't set the tone as much as they follow the trend. If you're sick of the high-pitched male shrill backed by music that should explode but fizzles, this is a surefire miss.